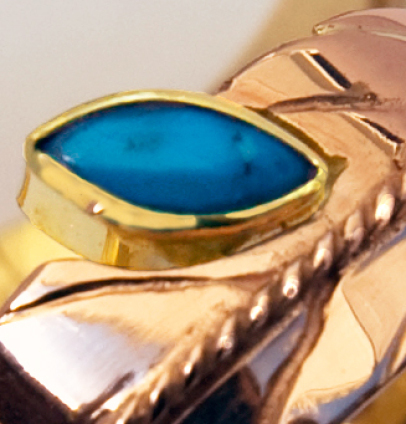 Materials & details: 14K yellow gold ring shanks; 0.236 x 0.118 inch (6 x 3 mm) pointed oval-cut turquoise cabochon and a white 0.06 ct. brilliant-cut diamond (Top Wesselton-V.V.S.I.- F/G-(2-2)-422) mounted on 14K red gold feathers. 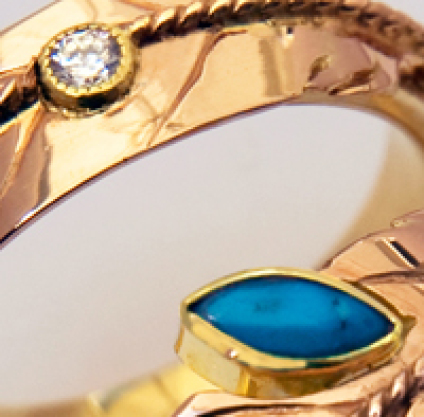 Both stones are set in 14K yellow gold bezels. SCROLL DOWN to read about the symbolism of the rings. *Persons who hold a Canadian First Nations status card and live and work on their reserve are generally tax exempt. 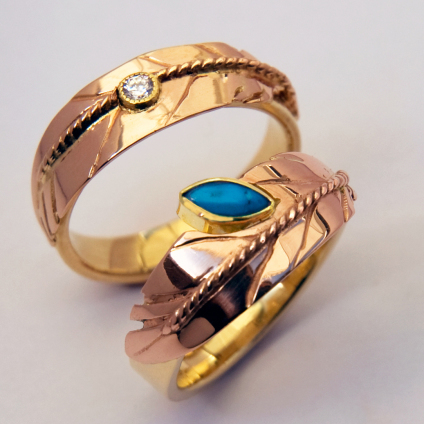 Jeweler artist Zhaawano designed and handcrafted these bicolor gold engagement rings from 14K yellow gold (the ring shanks) and 14K red gold (the stylized eagle feathers). The oval-cut pointed turquoise cabochon, which the jeweler cut by hand from a turquoise nugget, and the brilliant-cut white diamond in the engagement rings symbolize plant seeds that awaken as soon as the first rays of Gimishoomisinaan Giizis (Our Grandfather Sun) wake up nature and Migizi (the White-headed Eagle) spreads her wings and dives across the Great Lakes in the direction of the land of E-bangishimog, the Spirit of the West. The jeweler’s ancestors knew that the awakening of the seedbuds and the plant seeds that are hidden in the Earthmother are the first silent sounds of Creation at dawn. The seed is a mystery. The seed symbolizes a child. The seed is possessed by spirit, it will heal like earth's medicine.